As dozens of households in the Al-Arm village received their labor wages for building their roof-top water tanks, they have improved a number of harmful coping strategies that they had adopted to cope with the effects of the ongoing war and increasing poverty. In this remote village in Radfan district (Lahj governorate), the population had suffered from poverty and the nearby wells dried up. They became no longer able to afford buying trucked water because its price had doubled seven times of the price in Sana'a City. Young girls and women were forced to travel for long hours to neighboring villages in order to bring water on their heads and on animals amidst the summer heat. Some women were subjected to abortion and some girls dropped out from the school. The SFD's focus group interviews with a sample of a total of 170 beneficiary households displayed that several aspects of their living conditions have improved, notably the sustainable availability of life-saving drinking water. This cash-for-work project has provided with hundreds of jobs to families' members, many of whom had returned from the cities because of the war, and they provided their families with water and cash to purchase their necessary needs. This improvement has taken place after the families had curtailed their meals and removed many food items from their menu in the past. A number of households heads reported that they turned their daughters to school this year, and they gained basic building skills such as stone-shaping, building and plastering. Some households have also been able to buy some productive assets to help them generate income, while in the past some of households had previously taken debts and/or sold their livestock and valuables. The worker Mohammed Thabit Ahmed passed away in the middle of the project. His wife, Zikra Ahmed, then continued the remaining of his share of working days and took responsibility for supporting her three kids. After the project was completed, she said that the tanks and labor wages have met the family's priorities in its most critical time due to the ongoing war impact and the death of her husband. "Our tank has saved an arduous task of fetching water, so I can devote my time and effort to take care of my children and look for resources to support them," added Zikra. 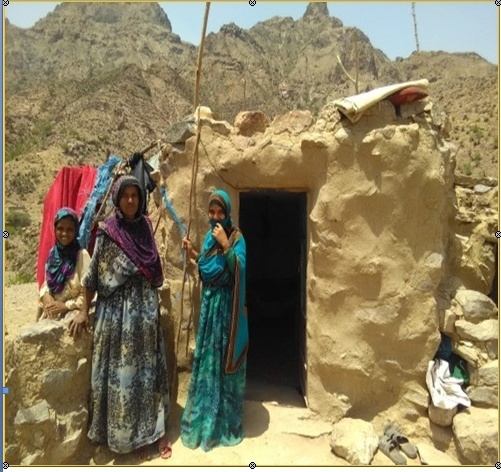 "Now the water tank is close to my house, and I just get water whenever I need it especially that I suffer limp," said the beneficiary Mrs. Shams Saleh Qasim. "We had been fetching water from the neighboring Allasub and Alsaraya villages in a several-hour foot round-trip." Shams' disability did not prevent her from participating in building her household's tank along with her husband Ali Ahmed Qasim, "We had sweated, worked and built, and brought stones and water. We used the cash the SFD gave us in building and providing healthcare to our children," said Shams.